I’m glad this was the book we voted on for this blog hop, because in some objective ways it’s the best of Henry’s work. It has everything that’s typical of her books – boy + horse, hardship, loving homes after a lifetime of difficulty, a truly special horse, Wesley Dennis illustrations, and quirky animals – and add to that some really compelling history. If you haven’t read it, here’s the gist: a slave boy named Agba raises an orphaned colt, named Sham, in the stables of the sultan of Morocco. That colt grows to a stallion who is sent to France, and then to England, encountering hardships along the way. Agba stays with Sham throughout his life and eventually sees him become the pride of the Earl of Godolphin’s stables, passing on his speed to his offspring and becoming a founding sire of the Thoroughbred breed. I do love this book. Reading it is an intensely nostalgic experience, and I can almost remember all the many places I read and re-read it as a child when I am in the midst of my favorite scenes. It’s an intensely sensory book: I’ll never forget the breaking of the fast of Ramadan in the opening scene. There are some really fantastic things about this book, and one thing I noticed on this re-read was how well Henry portrays a Muslim culture. It’s dated, yes, and has a bit too much “mystery of the East” going on (see also, Orientalism, but honestly it was written in 1949 so for its time it’s pretty grat), but it’s a sensitive, forthright portrayal of a hero who is a) a person of color and b) a devout Muslim. The world needs more of that! The cast of secondary characters are also really wonderful, and support the main narrative in note-perfect ways, from the French court to the streets of London. One character that stood out in particular was Jethro Coke, the Quaker who rescues Sham and Agba from Paris, but who caves to his daughter’s demands and gets rid of Sham after his son-in-law turns out to be a foppish, useless idiot who can’t ride. That’s so human – so often in stories like this people are wholly good or wholly bad, and the people in this book are often mixed up and acting in unexpectedly disappointing ways. There’s also some of the usual stretching of equine physiology: are you telling me that someone thought it would be a good idea to have horses fast for Ramadan? No one colicked? In the desert? (I wonder how historically accurate that is?) All the crazy things that Sham has to do and put up with. The fact that a series of experienced horsemen look at Sham and think he’s not a quality horse, when any half-decent horseperson can look even at a starved horse and get an idea for its quality. Yes, it’s harder; no, it’s not impossible. All in all, though, this is a wonderful book. I read it in one big gulp, and have easily read it two dozen times over the years. It’s nearly a perfect horse story, and it certainly hits all its emotional moments squarely on the head. Henry knows her horses, and the horse behavior is – naughtiness notwithstanding – compellingly described. Anyone could sympathize with Agba’s plight and his devotion to his horse. I love it. I’d recommend it to anyone looking for a good horse book to read, and especially to kids who are ready to get sucked into the horse world. Previous Post Heads Up: Great RoadID 15th Anniversary Sale! Great review! I actually am very meh on King of the Wind but you can read about that in my review tomorrow! This is a great review!! If I have some time this weekend I may grab it and try to catch, I've never read it before. 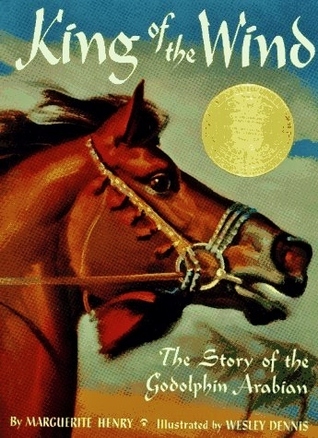 King of the Wind was one of my favorite books – I haven't read it in forever. Thanks for posting!